WHAU REAL! Auckland’s hottest neighbourhood arts festival is back for 2015. 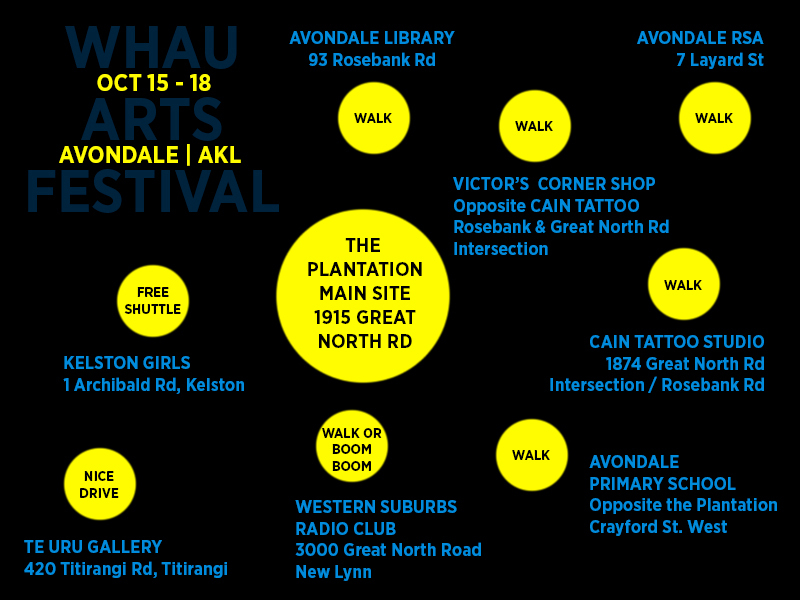 In 2014, the inaugural Whau Arts Festival exploded onto Auckland’s creative scene with involvement from over 120 artists, 30 businesses, and thousands of audience members over four days of intense artistic activity in Avondale. That’s right, Avondale – Auckland’s new creative mecca for anyone keen to get out of the gallery ‘box’ and see high-quality art that is simultaneously site and community responsive: in other words WHAU REAL! In 2014, visitors to the festival site, (usually a vacant concrete lot) experienced everything from poetry, street art, music, theatre, dance, installations, sculpture and more. Driven and curated by multi-disciplinary arts group Whau the People, the 2015 Festival is set to meet the 2014 bar, if not jump over it! This year’s festival will include a range of projects from Whau-based professional artists, as well as a number of projects where professional artists have teamed up with community groups to co-create work. In the mix are collaborations with the local boy racer community; live-tattooing based on custom-made typography; a blacksmith working on site; a gig at the old-time-NZ surrounds of the RSA; a community theatre show based on the stories of the Avondale shopkeepers; a pop-up family portrait studio; and the Whau’s first-ever live lip-sync battle. Keeping with idea of work that evolves over the four-day festival period, this year’s event will also have its own newspaper, Localise, which will be created on site every day, with a new issue published and available daily. The newspaper will include feature articles, reviews, photography, cartoons, and is offering free advertising to local businesses. 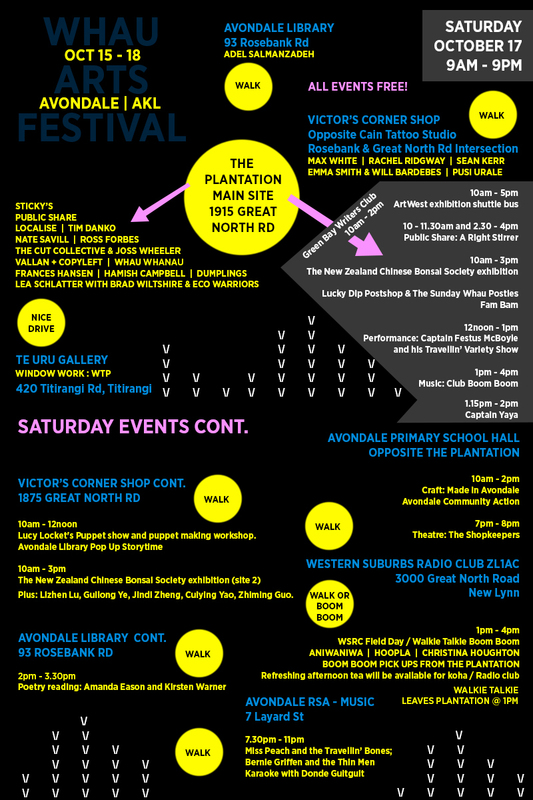 The Whau Arts Festival runs from 15 – 18 October, 2015, and will be centred around the Urban Plantation at 1915 Great North Road (opposite Avondale Primary School). 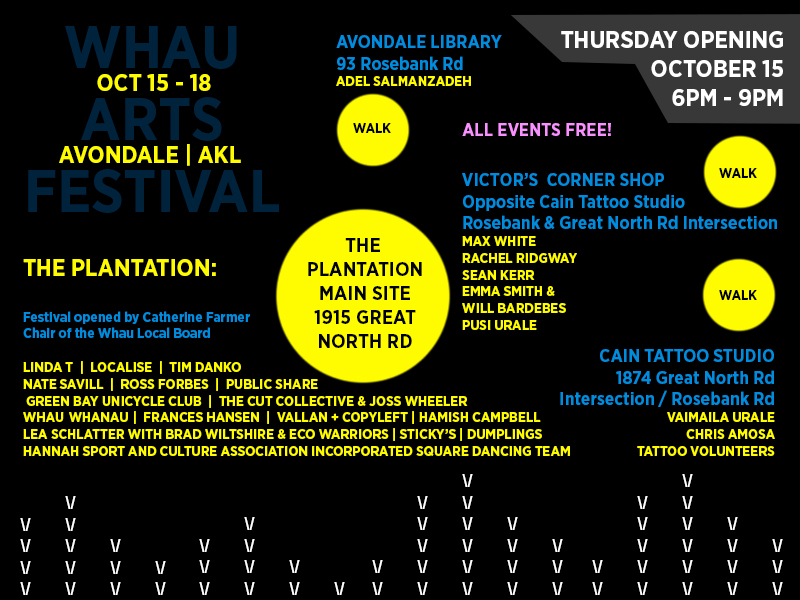 All events are free, thanks to the support of the Whau Local Board. Programme information will be available from the end of September at whauthepeople.com. 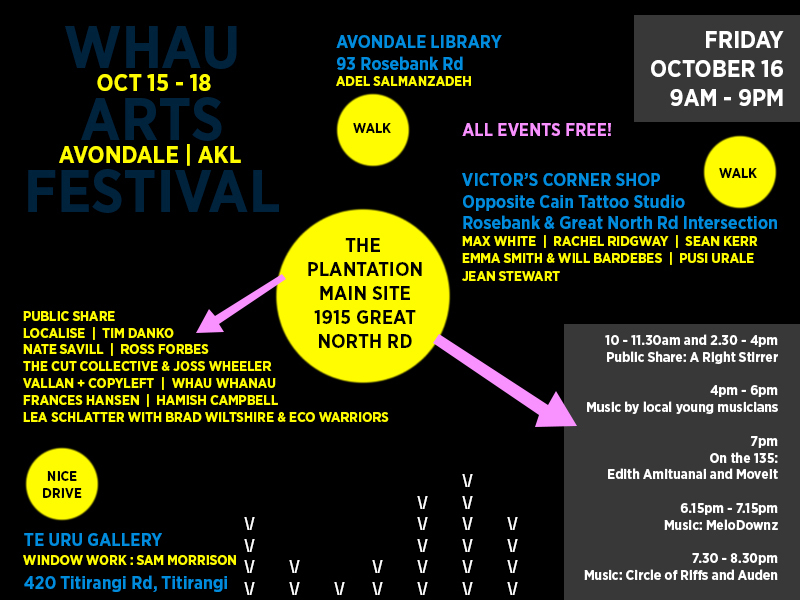 Two Avondale artists are collaborating on a tattoo art project, open to the public during the Whau Arts Festival opening. Typeface – Live Tattoo Session will include tattoo’s designed by artist Vaimaila Urale and applied to volunteers for free, by Chris Amosa, tattoo artist and owner of Cain Tattoo Studio on Great North Road, Avondale. Vaimaila uses universal computer keyboard symbols such as backslash / and forward slash \ and mathematical characters < and > to create Polynesian inspired tattoo designs. The artists are putting a callout via social media for volunteers who would like to participate in Typeface- Live Tattoo Session and receive a free tattoo. Vaimaila Urale was born in Samoa and currently lives in Avondale. Her experimental art practice has a strong focus on collaboration and audience interaction. She is interested in challenging ways in which viewers experience and engage with art. Much of her work involves digital processes and audience participation. 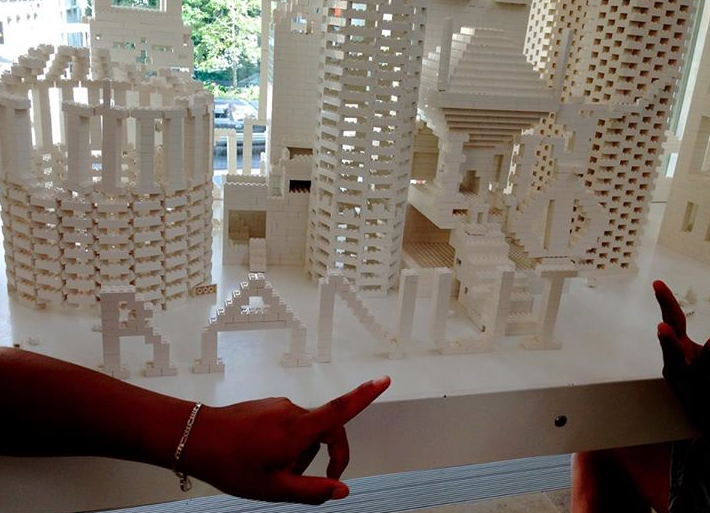 Vaimaila is also a member of art collective D.A.N.C.E. art club. In 2015, Chris Amosa in partnership with his brother opened Cain Tattoo Studio in the heart of Avondale. An Avondale resident for the past 13 years, Chris has worked as a tattoo artist for 8 years. Also an accomplished musician, Chris is a keys player for The Daylight Robbery, the backing band for David Dallas. The work of Copyleft is created in response to site. By working collaboratively a social space is created, dismantling the hierarchies and boundaries between past, present, artist and audience. Members are: Afreen Naoroji, Frida Keegan, Kaoru Kodama, Rosza Majsa, Wai Ching Chan, Emily Cloete, Joseph Durana and Tom Hackshaw. Copyleft have teamed up with local artist Vaimaila Urale to paint a 60+ metre mural. Signature characters taken from the Typeface project will cover the festival site with a response performance by Copyleft members during the opening night of the festival. Curatorial project manager Allan Haeweng, is an emerging Pacific art manager from New Caledonia. Allan has studied humanities and arts subjects, particularly literature, in Brisbane, Australia and Paris, France. He is currently completing a Master of Arts Management at AUT University. Strata aims to present a world created to reveal what usually goes unnoticed, adding detail to Avondale’s place on the map. I had an opportunity to collaborate with Avondale Primary School’s eco-warriors (Rm18) to create a 3D model of a tiny suburb. With commotion often happening above ground, the purpose of this project was to draw attention to what’s below it. The eco-warriors began by constructing a giant map to reference home – from there we collected materials found in particular locations around Avondale through walking and exploring together. The outcome of this adventure will become an Installation work at the festival site, with a documentation film by Brad Wiltshier. I am excited to be pursuing more photographic projects involving communities while also building up my commercial experience. I find these social interactions essential to shaping my practice. Lea Schattler is an Auckland based photographer and assistant who recently completed a BFA at Whitecliffe College of arts and design in 2014. Many thanks to eco-warriors and Avondale Primary School for supporting this collaborative project. The first Koha Shed in Aotearoa was established in Whanganui in 2011. Since then, 12 more have popped up around the country including the Whau as a place where you can donate useful things like clothes, toys, shoes, household goods and furniture to redistribute amongst the community free of charge. The Avondale Koha Shed will open as a one-stop pop up depot & exchange. Supplying the usual wares;clothes and household goods with a few odds & ends to add to the mix. Drop by and help yourself – everything is free! Share the love by donating your own items, we’ll be taking the usual drop-offs plus a display table for any special treasures we find in the mix. We encourage everyone to come by and get creative, mix & match your found treasures to take home or gift to another passerby. This is a chance for anyone and everyone to discover for themselves what it’s like to ride in one of those cantankerous cars which rattle the teeth and the trunk. Think of it as a vibrational discotheque… a slowly lapping motion master… an urban promenade. This ride around the block is a tribute to aural graffiti, and a celebration of Whau’s sonic palette. Entry to CLUB BOOM BOOM is free. Dress code is whatever the dang heck you wanna wear. So sit back and chill! DJ Aniwaniwa will see you through with a live mix that will shake your booty for you. ANIWANIWA is a producer of time-based experiences traversing the va/wa between the club, the concert hall, the street, the gallery and te irirangi. She is a member of Opaque Clique, the Auckland-based artist collective creating space for minorities diluted by homogeneity in New Zealand. Walkers from the next project will be able to hear us driving around and we’ll be delivering/picking people up from the radio club. HOOPLA are collaborating with the Western Suburbs Radio Club ZL1AC at their clubroom located at 3000 Great North Road, where the road crosses the Whau River (look for the huge balloon). Come and find out what happens in this small building that many of us pass by daily but know little about. Refreshing afternoon tea will be available for koha. Open Saturday 1-4pm. Part of an offsite suite of projects with BOOM BOOM and WALKIE TALKIE, both of which will visit the Radio Club site. HOOPLA: Projects for the Whau are Rohan Bush, Nina Patel & Kathy Waghorn. HOOPLA is a local independent collective that develops public realm initiatives to reconnect the Whau river with its urban environment, creating new opportunities for its rejuvenation and use. HOOPLA produce the Flotilla Whau, an annual event on the river open to all come-ers. Explore unknown territories, sensory experiences and stories of the Whau, with Christina Houghton and The Friends of the Whau as we circumnavigate the Avondale Racecourse and traverse the banks of the Whau River. Join us as we walk/bush bash between the plantation site and Great North Road transmitting radio locations as we make our way to the club FIELD DAY at the WSRC Club. Brought to you by Wild Walks West a Creative Communities project. We will be leaving on a walk at 1pm from the Plantation Site. We will walk about 1 hr to the WRSC for afternoon tea. Bring Gumboots or sturdy footwear- Suitable for older children but not Prams or little legs. Christina is a choreographer and artist who is interested in risk and survival in relation to climate change. Living in West Auckland she has a strong connection to the Whau waterway, (she made a dance about it for her masters) the Waitamata and anything to do with boats and weather. Walkie Talkie is one of a number of Wild Walks Christina is developing, supported by the Creative Communities fund, with the aim to engage people with everyday places. Some of her walking works include audio tracks and pieces of performance such as her Survival tours (in Last years Festival). Others use historic photographs, old drawings and maps to bring attention to what lies unnoticed particularly in places that might be forgotten or neglected, such as local waterways and harbours. Whau Flags is an interactive visual design experiment. Flags are produced through random generation, user interaction and genetic algorithms – creating new and novel designs that will be displayed live at the festival. Throughout the festival the designs will develop and evolve with minimal interference from the creator. Hamish is a local software developer and tinkerer who enjoys experimenting with code and design. We are a group of 6 students working on an architectural project for our Digital Fabrication course from Auckland University. Our names are Ping Ang, Zoe Haysom, Cheryl Wallbridge, Loretta Gerrard, Eva Cunninghame and Jorgia Bennett. We are in our 3rd year of BAS Architectural Studies and have participated in the previous Whau Art Festival as Antigravity and also in FESTA Christchurch festival as Continuum. All of us love chocolate. Our installation is based on the Triton Shell, combining technology to create a homogenous, modular design. We have chosen a triangular tessellation to create a flexible fabric out of the material wood. Our challenge is to create fluidity and folding through a solid material, effectively making a unique atmosphere. We aim to create a dynamic, adaptive, fabric that you will experience as you travel through! 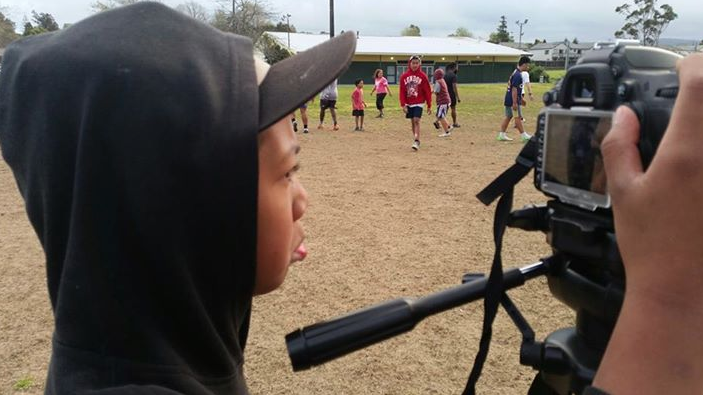 10 -11 young people, as part of the Move It Youth Holiday Programme will make a short movie, no longer than 2mins. The common theme is the Western line train that connects Ranui to the Whau (Avondale) and to the Auckland Art Gallery in the city. Pusi Urale’s Bombshell Pin Up series is inspired by the way Polynesian women have historically been portrayed by male artists as dusky maidens. As an older Pacific Island woman, Pusi plays with this imagery by painting European woman with Polynesian tattoos. Pusi Urale is a 76 year old Samoan artist who lives in Avondale. She is a retired school teacher, mother of six children and a grandmother of fifteen. Pusi started painting in her 50’s and has a Diploma in Art & Creativity from the Learning Connexion in Wellington. Today she continues to paint in spite of her fading eye sight. Cut Collective has always been about accessible art without the hierarchical aspects and exclusivity of the contemporary fine art model. We have always made art for our community and we still just want to paint walls. Cut Collective will be working with Jos Wheeler in the creation of a large scale mural that addresses some of the concerns coming out of the TTPA. It’s an opportunity to teach ourselves more about the issues and how they might be relevant to creative practitioners, artists and our communities. Rachel Ridgway is an Artist and photographer based in Auckland, New Zealand.Documentary and found photography practice, exploring themes of family, memory, and censorship. I’m a visual artist who combines traditional blacksmithing skills with more contemporary art practices to create a range of objects; some functional and some not. My plan is to make 2-3 hanging structures which resemble large mobiles. These mobiles will be made up of hanging discs on which there will be ‘diorama’ which reflect the vibrancy, chaos and diversity of the city. Artist Quishile Charan enlists textiles in protest against conformist Western dress codes. Investigating masi motifs, natural dyes, screen-printing techniques and the history of dress, Quishile re-claims an indigenous approach to adornment. What began as a personal exploration of cultural identity here evolves into a critical strategy for identifying and rejecting the Neocolonialist norms and cultural repression woven in everyday expectations. The Walk to the Sea is an animation that conflates notions of journey along the Whau river and surrounds. Actual sites and structures of import are embedded in a more unfamiliar or imagined narrative. This narrative overlay speaks of a slow wander away from the known and familiar toward a landscape of estrangement. Pylon structures become supports for strange confidence courses, a commonplace smoke stack harbors more sinister and pervasive industrial intent, looming overpasses forfeit notions of arrival in their incomplete states. William & Emma live in Blockhouse Bay. Emma has a MFA from Elam University of Auckland. Her primary practice is Painting. William holds a MDES from Unitec. His primary practice is Graphic Design. William and Emma both teach in their respective fields. They collaborate in this project for the second time. 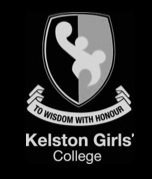 ArtWest 2015 is a public exhibition of West Auckland artists organised and hosted by Kelston Girls College. First established in 2009 this is the third ArtWest exhibition. Embracing the breadth of art created in West Auckland the exhibition will include paintings, sculptures, ceramics, textiles, photographs and film, with many of the works for sale. 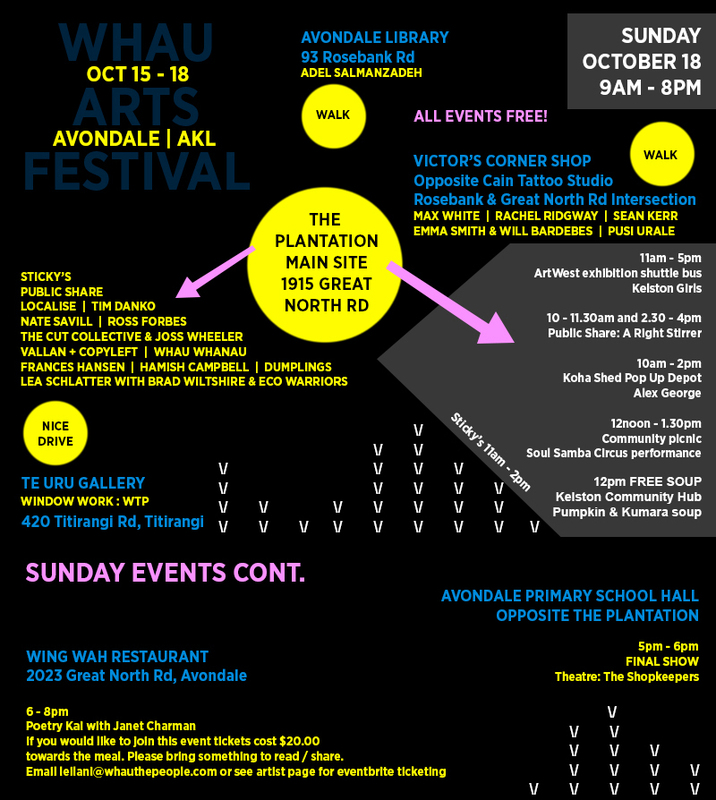 ArtWest is an opportunity to celebrate and support the creativity and unique identity of West Auckland. With art by nationally and internationally acclaimed artists on display, artist talks and free creative workshops for adults and children ArtWest promises to be inspiring weekend event. This presentation comprises a slideshow video, which records the 2009 fire that destroyed the old tram barn buildings at the Jude Street Roundabout in Avondale. The sequence covers the fire, demolition and clearance of the site. And continues through the 2012 replacement build of ‘Carl’s Junior’ and associated food outlets. It is accompanied by a sequence of five photographic works from “the wild”. These images could reference the land before settlement as ‘untouched’ and ‘natural’ in juxtaposition with the “now” built environment of the Whau as shown in the video. The trademark symbol in the title references the branding of this country as ‘naturally green NZ’ and ‘Carl’s Junior’ Americana, in the context of the gospel style lyrics of Van Morrison’s ‘Brand New Day’. Media contrasts “monumental” landscape traditions of the static image with a video of Avondale suburbia. Max White has lived in Avondale since 1982. Worked in Art and Design education for over thirty years, at both secondary and tertiary levels, the last twenty at the Auckland University of Technology. and 1 half of the hip hop crew “Third3ye”. I was raised in Avondale and went to Avondale Intermediate and College. I was heavily into Rugby and Basket Ball until I developed the love for more creative endeavours. 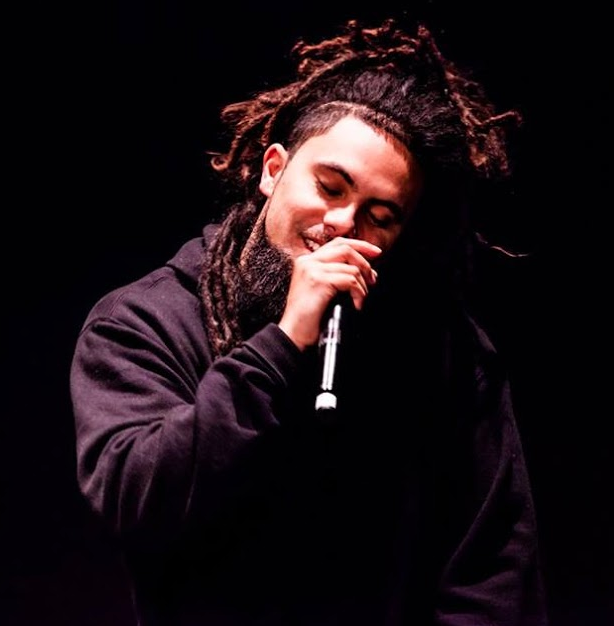 I started freestyling at house parties and writing rhymes after school and that’s pretty much how I got into music/hiphop and doing live shows. My favourite island food would have to be my late grandma’s supa sui and rice with palusami and a cheeky keke pua’a. I am of Samoan, Euro and Maori decent. This project begun when I took up jogging around my neighbourhood. Using the excuse of picking up litter to catch my breath, I started finding hand written notes and then begun to collect these, very soon I had amassed many.I found these notes to represent a huge cross section of goings-on in my neighbourhood, I felt like an anthropologist conducting an unscientific survey of recent history of human activity in my catchment area. The notes I present in NOTES FROM AVONDALE become a narrative into our community, they present a reading, a snapshot, a moment of happenings that will be familiar and perhaps promote an introspective consideration of ourselves. Frances majored in drawing at art school in Sydney (NSWCOFA) before completing an MFA at Elam. She teaches at the faculty of Creative ARTS at MIT. Avondale community has enjoyed a library service since 1876 when the Whau Public Hall opened opposite the Presbyterian Church (St Ninians) on the now St Georges Road with books solicited to form a library. Fast forward to October 2015 and we offer services for children and teens, books for babies, makerspace, e-books, computer services, Wi-Fi, book a librarian and much. What are you waiting for? Join up it’s free. 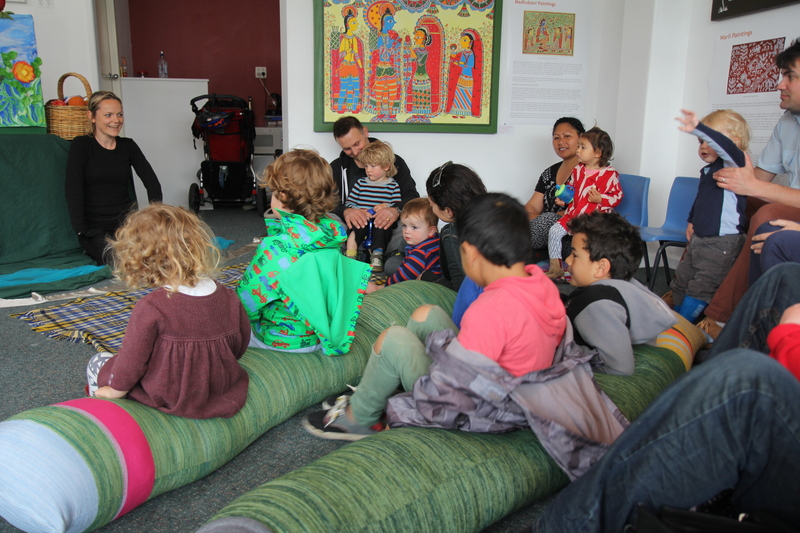 Avondale Library will hold a pop-up story time session as part of the Whau Art Festival at the Cnr of Great North Road and Rosebank Road inside the business premises. The session will feature story reading, finger rhymes, songs and much more. My last project and some of the work that I’ll be showing at Whau Arts Festival will be from my book collaboration with NZ poet Richard Van Sturmmer. These Persian miniature inspired works often represent words and images. The words are written in Farsi and English and the images are symbolic representations of NZ and Pacific landscapes. In my work I try to highlight social justice issues and to convey message about the state of the world. Adel is a Persian / Kiwi Artist who grew up in Petone. In recent years my work has mainly been what I call Poetic Miniatures. Some of this has been in collaboration with other artists and poets. Lucy Locket will do a short puppet show (around 20 minutes) with lot’s of nursery rhymes and some music and finger play, and then will invite the children (and parents) to take part in a fun puppet making workshop. We will use upcycled wooden spoons to create our own character puppets. Lucy grew up watching her parents perform their children’s shows, and comes from a puppet filled household. She performs at Kindergartens, festivals and for birthday parties. She is also the mother of two year old Oliver who loves puppets as much as she does, and who helps to inspire her work. Lucy’s favourite sandwich is a BLT with lots of added cheese, relish and avocado, and favourite dog is a golden labrador. Bernie Griffen and The Thin Men play a Saturday night party with their swampy style of folk-blues. Bernie Griffen works the room with his huge personality or drawing you in with a wry smile and wink. He writes songs that cut deep but sure as hell entertain. With swamp-folk-blues band The Thin Men, the performance is electrifying – expect to laugh and even cry. About: Bernie (long-standing host of radio 95 bFM’s Border Radio) and his musical partner Kirsten Warner are Whau dwellers from riverside Te Atatu South. The other Thin Men are with Brendan Turner (bass) and Cole Godley (drums). Miss Peach & The Travellin’ Bones have been performing across New Zealand with songs and stories from their approaching new album, currently being recorded at Red Room Studios. Miss Peach (aka Jodie Peach) is the Mistress behind the magic. Her vocals and song writing talents beautifully enhance her true gift as a story-teller. She travels her audiences to places of scent and wonder, leaving them yearning for more. She is classically trained in voice, self- taught in guitar, and a natural on the spoons.She brings both light and laughter to her audience, welcoming them into her home…the Stage. Sharing stories from the heart, she is simply divine. Miss Peach is joined on stage by Sarah Radford, Oliver Smith, and Richard Manic. Captain Festus McBoyle and his motley crew have been infecting NZ for over 4 years now. Offering full stage shows, roaming entertainment and Pirate Styled games, this Madcap troop are more fun than a squirrel up ya’ jumper! Cheeky and challenging, flaunting Vaudeville/Pantomime/Music hall origins. Appearances at most of NZ’s top festivals, everything from Womad to Splore to sell out shows at The Nelson Arts Festival. Their Debut album ‘ A Pirates Life…’ was selected as a finalist for Best NZ kids album at the 2013 NZ Music Awards. Dane Taylor is a musician in bands such as Evil Ocean, Invisible Threads and Smoking Daggers. He also exhibits visual Art and will have a painting up in Eighthirty coffee shop on Krd during Auckland Art Week. Casey Sinclair is a visual effects artist who works in film and television. They both live in Avondale. This will be Dane’s first venture into performing electronic music solo under the name Circle of Riffs. He will be using a midi controller to create a live performance using loops and samples. The resulting audio collage is influenced by the LA beat scene and UK Bass music but definitely expect some unique local flavour. Casey – who makes electronic music/visuals under the name Auden – will be using input from the music and a motion sensitive camera to create live visuals which respond to Dane’s music performance and also bristle with their own geometric energy. These visuals will be projected onto the streets of Avondale. Over a shared restaurant meal every diner at the table reads aloud a couple of poems they’ve written and/or a couple they like by someone else. Participants choose what they will read (and consume) at their table and this material is not externally monitored. Janet Charman has published seven collections of poetry. Most recently ‘At the White Coast’ , AUP, 2012, a memoir of her year working in London during the Thatcher era. The manuscript of this collection was joint winner of the 2010 IWW (Auckland) Kathleen Grattan Prize for a Previously Unpublished Sequence of Poems. Her collection ‘Cold Snack’ , AUP, 2007, won New Zealand’s annual Poetry Prize In 2008. 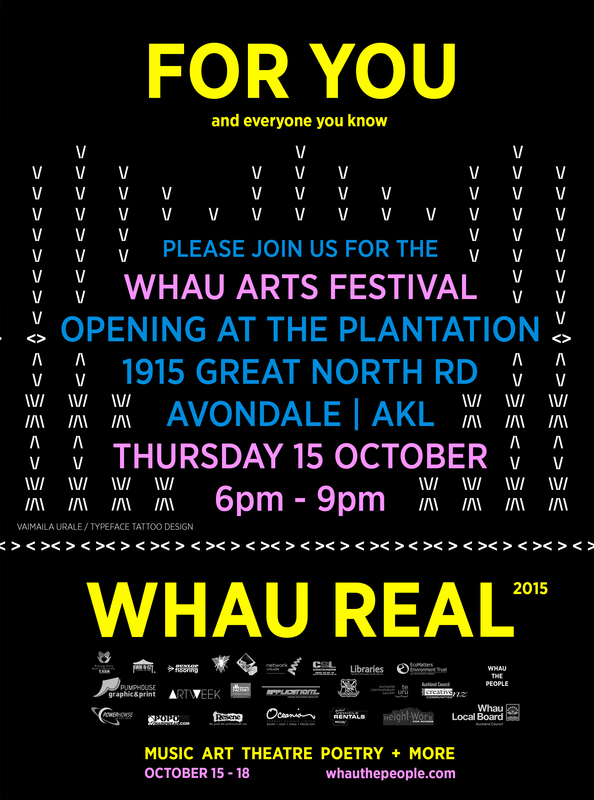 Public Share will create a tea station at the Whau Arts Fesival hub. As a collective of artists who like to make together, we’ve crafted and fired stirrers from clay dug from the Fulton Hogan worksite at the mouth of the Whau River. Complete with gold Public Share logo the stirrers sit somewhere between the decorative tourist teaspoon and the disposable coffee stick. Embracing the idea that a convivial break is often just what’s needed, we invite you to drop by for a cup of tea, and to use, then take away, a stirrer of your choice. PUBLIC SHARE, formed in mid-2014, is a New Zealand artist collective (comprised of Monique Redmond, Harriet Stockman, Kelsey Stankovich, Kirsten Dryburgh, Deborah Rundle, Mark Schroder and Joe Prisk) that works collaboratively to engage in ideas of sharing, production and exchange. Combining object making and site exploration with social engagement and critique, Public Share has a particular interest in workplace rituals, organising events that punctuate the day with pause and conviviality. 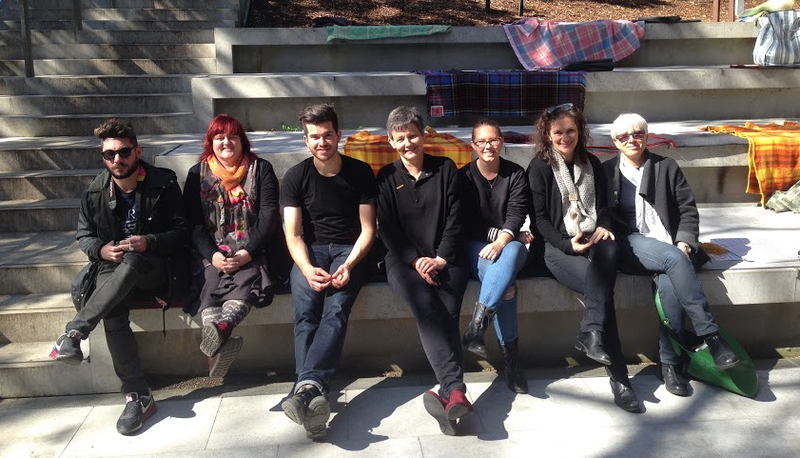 Recent projects include ALLOTTED BREAK(S); A break in proceedings / Irregular allotments for the Engaging Publics symposium at Auckland Art Gallery, 2014, Carried Forward for the ST PAUL St Curatorial Symposium also held at Auckland Art Gallery, 2015, SMOKO for Performing Mobilities 2015 in Melbourne. ‘Get your art a new audience, write a love letter to a stranger, make a poem and set it free, perhaps a tiny zine needs a new home? We’ll make our creative morsels on Saturday, to deliver to willing Whau folks. Stop by us and unleash your ideas upon paper. Your creation will be wrapped and entered into the lucky dip. Sunday is fun day for our pop-up Whau Posties. Dashing in both appearance and speed, they will deliver parcels on bicycles or foot to the Whau region. For Lucky Dip delivery, sign up on Saturday, it’s FREE. Everyone is welcome for all parts. If you would like to be make stuff, come along on Saturday. If you’d like to cycle/walk turn up on Sunday. (Though let us know first so we can brief you) If you want a mystery gift…..drop your name in the box on Saturday at the Festival hub. You do not have to supply a name, just an address is fine! We will not collect your details for any other purpose. Louise & Josca are a husband/wife team, who love art/craft/writing, cycling, and community projects. They boat-build, violin-make,wood-craft, folk-music-create, garden-tend, and make the most of lo-fi fun around Auckland City on their bikes. They’ll be joined by more creative friends at the Lucky Dip Post shop. 100% natural, refreshing shaved ice, catering for grown up and pint sized tastes with flavours like grapefruit and mint, raspberry and coconut caramel. Born out of our kid’s love of snow cones and our aversion to all the nasty chemicals in. On one of my many walks around Avondale I discovered “Valentine Books”, a local book supplier who routinely leaves piles of books on the sidewalk, free to passerby’s. I was intrigued by their sculptural possibilities and so about 2 years ago began experimenting. In an attempt to suggest movement and the absurd, I often attach wheels to my artworks so I felt comfortable attaching wheels to this new sculptural material. 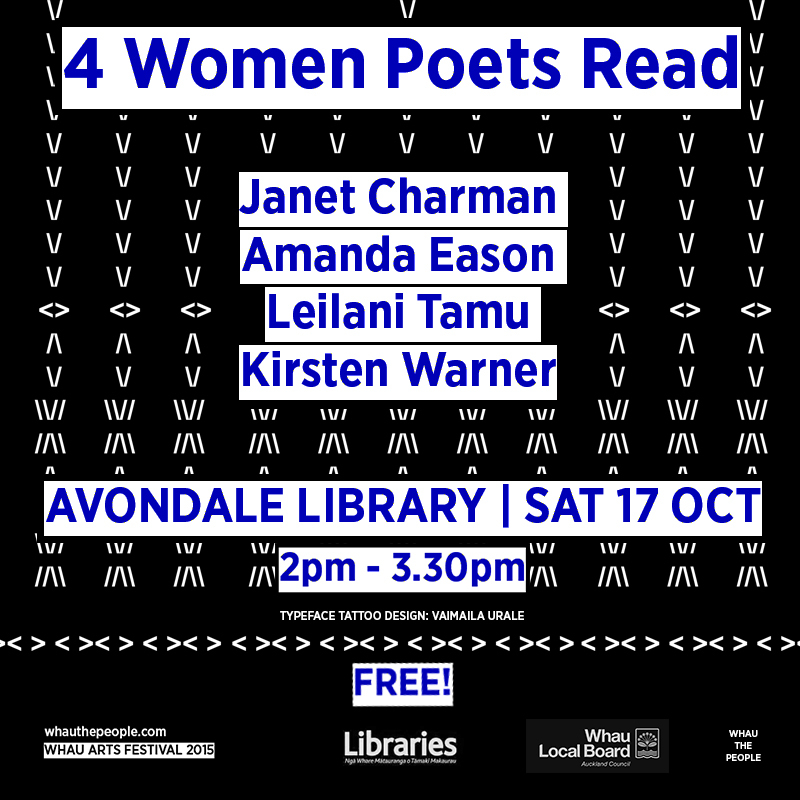 Avondale has both a library and its fair share of boy racers – why not combine the two? There are other metaphorical associations to be had in Zwischen Newa und Kaukasus but these I will leave to the viewer. Ross Forbes recently completed an MFA at AUT as an adult student. He earns his dollars as a builder and has done for some 30 years, a fact that has some impact on his sculptural practice. He has lived in Avondale for 16 years. We are a unicycle club in Green Bay open to all (young or old, beginner or long-time rider). The club runs every Monday after-school for unicycle-based games, practice and all kinds of one-wheeled fun. The show will be a short unicycling performance exhibiting some of the cool things you can do on one wheel. About the workshop: Try your hand at riding the unicycle with Tony Melton. Tony has taught hundreds of people the art of riding on one wheel and holds multiple NZ and Australian unicycle titles. Suitable for all ages. Unicycles provided as well as tiny bicycles and a miniature penny farthing for those who’s like a two-wheeled challenge. The Green Bay Writers are giving away short-short stories and poems. Tell us your preferred genre and give us something to go by, then come back a while later for your very own piece of creative writing. Green Bay Writers was established in 2010. We meet every 1st and 3rd Tuesday (7.15 to 9 pm) at the Green Bay Community House. Currently, we are working on our first publication. New members welcome. Playing exciting and dance-able music, with driving latin percussion, brass and vocals. Soul Samba Circus are a high energy collective who come from a range of musical backgrounds and styles. From samba percussion, soul, funk and afro – to blues, ska, and much more. For your listening pleasure, this kaleidoscope of sound has been poured into the melting pot to create one hot soul samba masala. Localise is a temporary newspaper publication that will accompany the Whau Arts Festival 2015. Each issue focuses on the subject of community art, exploring how art, and even the newspaper itself, can meaningfully engage with local residents. Localise will be published daily from Thursday 15 – Monday 19 October, with 250 copies available for free each morning. Ioana Gordon-Smith is a curator at Te Uru Waitakere Contemporary Gallery and Lana Lopesi is a writer and designer and editor of #500words. Hands on Creatures are bringing iconic LIVE Avondale SPIDERS to the Whau Arts Festival. Considered to be almost extinct in the wild this may be your only opportunity to view New Zealand’s BIGGEST but lovely, harmless, huntsman spiders. How about FACING your FEAR and enjoy holding one of these wonderful and famous spiders. We will also be displaying a selection of other NZ spiders and those commonly mistaken for the real thing! Don’t worry we will leave the TARANTULAS at home this time!!! Born with a compulsive irresistible fascination and love for the smaller creatures of this world I have been studying, keeping and enjoying them both professional and as a hobby for the whole of my life. This passion is also now shared by my “Lady Buggar” partner Tikvah. The highlight of this obsession is when I am able to share “creature beauty” with other interested parties. Creatures Unlimited has been referred to by the film,TV and advertising world as the GO TO GUYS for all creepy crawlies – insects, spiders, worms, amphibians and reptiles – all safely contained at our “Creepy Crawly House ”as it is called. Hands on Creatures is a traveling interactive and educational show of our beasties where we visit child care centres, schools, birthday parties, field days or anyone excited to see our minagerie. New Zealand Chinese Bonsai Society Inc. is committed to the practise and promotion of Chinese bonsai art in New Zealand. Bonsai art originated in China 1200 years ago. It reflects oriental philosophy of being environmental friendly and creating the Yin Yang balance in human life. We want to showcase Chinese bonsai art to visitors of Whau Arts Festival 2015. The 39 finely selected artworks are created by our members. Some of these live artworks have been maintained for more than 20 years. It covers a wide range of plant species such as pine tree, tea tree, etc. A lot of our artworks are made of local plants. Our artists present them in various and genuine Chinese bonsai designs including single trunk, lean trunk, forest, fruit, flower, water/land, landscape, etc. It reflects the oriental philosophy of human life and the environmental Yin Yang balance through the shape of the artworks. Bingyu CHEN, whose native place is Lianshui county of Jiangsu Province in China, was born in 1934. Being instructed by leading masters, she practised Chinese calligraphy since her childhood. The art practice is essential for her to master the fine tune of Chinese art. Ms CHEN also worked tree planting for years in youth. The valuable experience brought her knowledge of plants. From 1980s, with the advantage of Chinese art and knowledge of plants, she began to learn Bonsai. In 1998, when she immigrated to New Zealand, she co-founded New Zealand Chinese Bonsai Society Inc. Now, Ms CHEN is the chair person of the society. She gets involved in other organisations as well, being honour committee member of New Zealand Chinese calligraphy society Inc. and the chair person of Bridge of Love association Inc. She still practises Chinese calligraphy appraising the elegance of bonsai. Xueyuan YANG, whose native place is Zhenjiang city of Jiangsu province in China, is the founder of New Zealand Chinese Bonsai Society Inc.. He practised bonsai art from 1980s, building up his own bonsai garden. Since he immigrated to New Zealand in 1998, he began to create bonsai artworks seedling with native pine. Mr. YANG has given complimentary bonsai workshops to local fans at his garden in Auckland for years. In the mean while, he expressed knowledge of Chinese bonsai to local communities as a volunteer tutor. Mr.YANG organised conversations between Chinese and local Kiwi bonsai artists. His fine bonsai art works were appraised in a few of art exhibitions. In 1998, he was invited to give a Chinese Bonsai presentation in the International Bonsai Expo. Xinhua HE is the secretary general of New Zealand Chinese Bonsai Society Inc. He likes gardening and bonsai art. There are 6 years that he has been creating bonsai. His favour style of bonsai is landscape which provides beautiful blending of poems and paintings in his bonsai art works. Those bonsai gained appraise in various art exhibitions in Auckland. Haihua CHEN is the vice chairperson of New Zealand Chinese Bonsai Society Inc.. He practised gardening since his childhood. 10 years ago, he began to create bonsai art works. At the moment, he has had 200 bonsai art works in various themes in his Auckland garden. Mr. CHEN attends bonsai exhibitions in Auckland often. Yingjia HUANG started to practise bonsai 10 years ago. She was impressed by the natural elegance of bonsai art. Her bonsai art works include series of water / land and forrest style bonsai artworks reflecting elements of natural landscape of New Zealand. Huifang LI has been a member of New Zealand Chinese Bonsai Society Inc.. for 11 years. She learned bonsai art when she was in China. After moving to New Zealand, she found that in New Zealand various types of plant provides unlimited opportunities to create bonsai art works. Ms LI devoted herself in this art. She focuses on bonsai styles of tree, flower, fruit, water/land and hanging. Recently, Ms LI promotes Chinese bonsai our communities. She believes that bonsai art is an ideal way to help people close to nature and enjoy the environment build up. Andy ZHENG has been a member of New Zealand Chinese Bonsai Society Inc. for 6 years. He was introduced to bonsai art by a friend. He was impressed by the beauty and knowledge which was well presented on a tray. Since then, he made efforts of learning and creating bonsai art, especially water/land style. Now he specialises with measure trays. This service helps bonsai artists crossing the boundary of containers. Elliot ZHANG is the vice chairperson of New Zealand Bonsai Society Inc.. In Nov of 2005, Mr. ZHANG was introduced to a bonsai workshop. He was delighted. Afterwards, he devoted himself to this art consistently. In terms of his contribution, he was promoted from a member of the society to a team leader. Xiangyun YOU was born in Taiwan. He has granted citizenship of New Zealand for 17 years. Mr. YOU loves plants and gardening. He has been practising bonsai art for nearly 20 years. He likes to use various and rare plant species to complete his bonsai art works. Recently, he gets used to looking after his bonsai alone in his garden. He believes that bonsai is an art representing elegance, health and knowledge. Huosheng Lin was born in Taiwan in 1952. He immigrated to Auckland in July 1992. Mr. Lin has been creating and maintaining bonsai art works for 33 years. He owns over 300 pieces of bonsai in his Auckland garden. Linda T is a Visual Artist and member of D.A.N.C.E Art Club. She works with video, photography, Installation and performance. Her work has been seen in many galleries across New Zealand and Australia. Last year with D.A.N.C.E Art Club, she attempted to break the Guinness World Record for the longest non-stop DJ session in Auckland’s Artspace Gallery with an epic 84hour set. The Shopkeepers tells the stories of those that work in and own the shops around Avondale; they are people that many of us see everyday, but what do we know of their lives? During this project we’ve discovered singers, professional league players, and people that have made tremendous journeys across the world; as well as someone who just wanted to eat their pie. The Shopkeepers is a semi-verbatim play, based on interviews that cast members have undertaken with retail workers and business owners. The cast is made up of local residents and retail workers, most of whom are not formally trained, but all of whom are pretty great! We make theatre that is collaborative, either in its making or execution. Bullrush makes work that doesn’t usually appear inside traditional theatre spaces: shows that tell stories that don’t usually get told; and features actors and performers that don’t usually get to be on stage. Bullrush is run by Bronwyn Bent, who works as a theatre maker across all types of theatre. An Avondale group encouraging “locally made” enterprise to emerge using local produce and materials. We’re all learning as we go by sharing knowledge and providing equipment at the ‘Project Room’ on Friday mornings every fortnight at the Avondale Community Centre. On Saturday it’s our Spring Community event – Roll up your sleeves and muck in at the a sewing table, immortalize your favourite old T shirt into a reusable bag, screen print it first if you want to. In the kitchen we’ll be making Citrus Cordial, from your local produce & we hope to encourage makers of other things to come and set up a table to sell their locally made wares. You’re invited to come and learn or share your knowledge at this “Hands on” community event. Limited T shirts will be supplied, please bring your own so you won’t be disappointed. Donations of local Lemons, clear bottles & metal caps or old T shirts are being gathered at the Avondale Library until Thursday 15th. 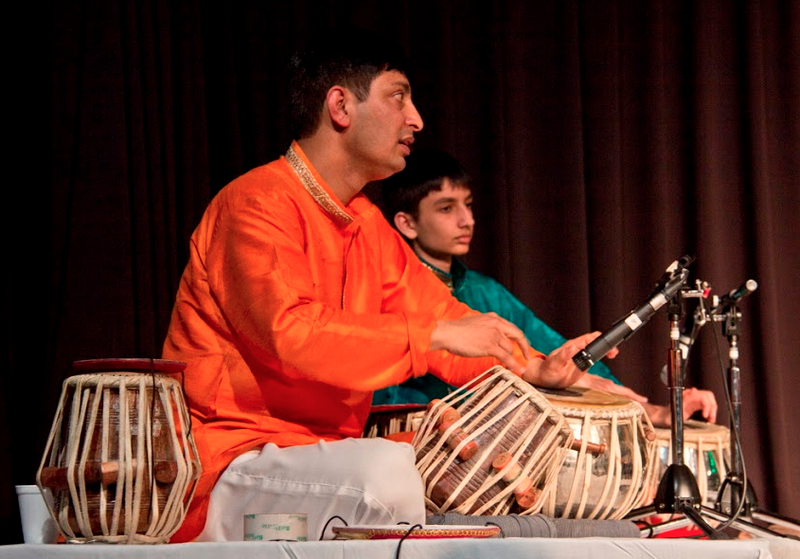 The rhythms of India will be presented on TABLA, north Indian percussion. The tonal quality and variety of sounds makes Tabla a very unique percussion. We will be starting with the traditional rhythms of India, known as Peshkar, Kayda, Rela & Tukras ( Singing rhythms of Tabla ) and will be presenting folk & fusion rhythms. The rhythms will be accompanied by melodies of Harmonium. Basant Madhur is a widely acknowledged tabla player and a much-respected artiste in the arena of Indian Classical Music. On account of his versatility, he is one of the most sought after & creative artists in the realm of Indian classical music in New Zealand and Australasia as a whole. He has performed with various international Indian classical musicians in India, USA, Australia & New Zealand. Sean Kerr is a local artist and likes to have a laugh once in a while. Sean Kerr is a Senior Lecturer at Elam School of Fine Arts and is currently completing a DocFA. Sean is concerned about our environment and is a cycling advocate. Some spiders build webs. Some spiders dig burrows. This spider fires lazars. Artwork by Whau local James Gray. This group brings together a diverse range of traditional and more modern art and craft forms, including kite making, jade carving, silk flower making, finger painting, and embroidery. Exhibition located at the Plantation for the duration of the festival. Ms Lizhen LU is a master of traditional Chinese handicraft of SU embroidery. She was born in 1954 and she was from Wenzhou city, China. Ms LU has been in this art for more than 20 years. In her artworks, she practises a unique method of OU XIU which is appraised as one of 4 leading skills amid Chinese embroidery art. Mr. Guilong YE was born in 1941 in Shanghai city, China. He is a senior member of Shanghai folk art kite institute. Mr. YE has devoted himself in kite art for more than 20 years. His fine kite artworks of eagles, dragon head and centipede body were awarded in kite expos. Mr. Jindi ZHENG is from Wenzhou city, China. He started his stone art apprenticeship to Master Jinyan LIN when he was 14. In 1980, Mr. ZHEN opened his own studio specialised in jade arts including portraits, plants, flowers and animal figures. His fine artworks were selected and published in the Wenzhou Daily. Mr. ZHENG and his artworks attended a number of art expos in China and overseas. He is popular in Japan, Taiwan, USA and Europe. After she retired, Ms Cuiying YAO was impressed by artificial flowers made of silk stocking. She started learning this special art in community art centre in Shanghai city. After years of studying, Ms YAO creates various style flowers to present to audience. Zhiming GUO was born in Shanghai, China in 1942. In 2003 he immigrated to New Zealand. Mr GUO specialises in painting with his fingers. This feature was displayed on NZTV1, TV2 and TV3. He gains various awards since 1962. There will be a frame of a house left behind that links to some stories left in the broken pieces, some stories told by the rubble itself. Material will come together and come apart, over several days. I am a cartoonist and have made my own comics for over 20 years. I have made these ghost comics in small bottles, on the inside wall of an empty abandoned building and as large expanded installations in art institutions. Suddenly everything looks like one big memory of a ghost comic. I am Donde M. Guitguit currently connected with Barfoot & Thompson as Real Estate Agent. 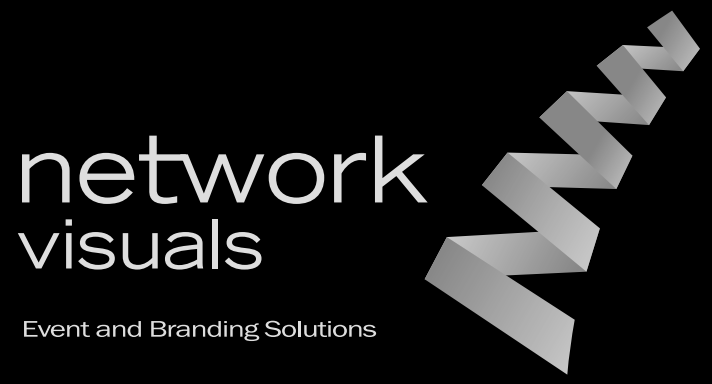 Armed with 16 years of experience and knowledge gained from a long and eventful life in marketing and management. With a proven ability to learn quickly, assess problems, and initiate corrective action, I am comfortable in fast-paced, high-stress situations requiring details and follow through. I believe that “You can get everything you want in life if you just help enough other people get what they want.” With this I realized that rewards and success in life will always be in direct proportion to service to other people and by continually looking for new and better ways to serve them better than anyone else. And outside my real estate career, you can join me to sing along and dance rock and roll music with the elderly at rest-homes around Auckland. Or watch me singing as guest singer to some organized community activities. You can also invite me to do karaoke for your special occasions like; Weddings, Birthdays etc….